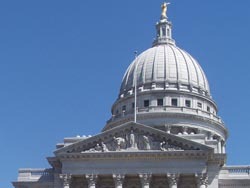 After an hours long overnight debate which saw minority Republicans offer more than 100 amendments to a state budget bill, the Wisconsin Assembly passed the two year spending plan early this morning. The budget, which covers a record $6.6 billion deficit through increases in taxes and fees, spending cuts, one time borrowing and accounting tricks, is also laden with public policy measures such as driving permits for illegal immigrants and elimination of the qualified economic offer for teachers. The policy items and tax and fee hikes are the main reason why the budget failed to get a single Republican vote this morning. The bill passed 50-48, with two Democrats, Milwaukee&apos;s Peggy Krusick and Manitowoc&apos;s Bob Ziegelbauer, joined the GOP in voting no, while Bloomer Independent Jeff Wood was among those voting yes. Assembly Majority Leader Tom Nelson of Kaukauna called the bill "a fair share budget" which includes $3.2 billion in spending cuts. But Minority Leader Jeff Fitzgerald of Horicon called the budget "a very typical Democrat product," with higher taxes, more state spending and dozens of pork projects and policy items aimed at special interest groups. The state Senate is expected to take up the measure next week.